How to Deal With Your Old Laser Die Board Cutting Machine? 1. Buy a new laser die board cutting machine. 4. Fix the problems and keep using you laser die cutter. 1. Because for the first type, buy a new laser die board cutting machine you have to undertake high finance pressure. 2. For the second type, you can not sell the old laser die board cutting more than 1/3 compare with the price you bought it. 3. For the third type, your low power laser die cutter can’t meet the production requirement,want buy a high power laser die cutter to solved this problem, you also have undertake more high finance pressure. Now, if you still worry about it and can not bear it, you have a new choice——Environmentally friendly die board sawing machine, which focus on three point: environment protection_high quality_low cost. Yisong environmentally friendly die board sawing machine uses saw blade cut the board automatically,which without using laser, no smoke, no toxic gas and no smelly. The environmentally friendly die board has higher quality,precision, accuracy, vertically and clamping force than laser die board.The whole production cost is 1/5 of laser die board cutting machine,the electricity consumption is 1/10 of high power laser die cutter and using normal plywood also can meet high production standards. 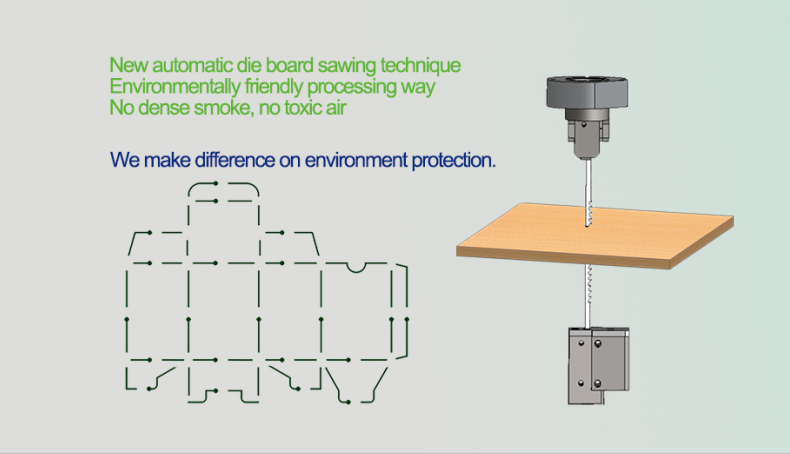 More information check it works on why environmentally friendly die board sawing machine can replace laser die board cutting machine.